As women and moms we really should hear more stories like Heidi’s stories. This Thanksgiving, Heidi and her husband hosted 15 Marines who couldn’t make it home along with her son for a hardy Thanksgiving dinner. Just when we were starting to think people had forgotten about the true meaning of “giving thanks and being thankful”, we had the opportunity to read this wonderful story.. This story is almost like a something from a fairytale. Fox 8 News wrote: It’s a time for family, but for some Marines serving at Naval Air Station Jacksonville, going home for the holidays isn’t an option. 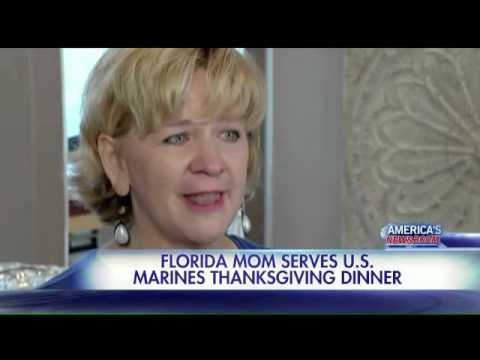 So Heidi and Terrence Barfield opened their home on Thanksgiving to 15 Marines. “These young men and women have written a blank check to the United States of America for up to and including their life,” Heidi Barfield told WFTV. “If it came to, could we peel an extra potato or a 40-pound turkey? You bet.” The group took a bus, donated by a local church, to the house. Businesses also donated gift cards and even the turkey. Many of the Marines serve alongside Barfield’s son, Pfc. Justin Hanes. “My house is your house, so I just made sure everyone knew they had somewhere to stay,” Hanes said. This week we were inspired by Heidi Barfield. She is our SHEro!